It shouldn’t be news to most of you that Inglot is now in Nigeria. If you are a regular BiL reader, you must’ve caught these previous posts here and here. Now I am quite aware that a lot of people here in Nigeria are not as familiar with the brand Inglot as they are with, say the likes of, MAC and Iman. And there is absolutely nothing wrong with that, I’m sure there’s brands I am yet to discover and I would like to know what sort of products they have. So today I just wanted to share with you guys a few products that are available to buy from Inglot, a sort of insight to a few products they bring to the market. I cannot confirm this, but these polishes are believed to be ‘water permeable’, thereby making them ‘Muslimah’ friendly. I would suggest you do your own research on this and don’t take my word for it. I only found this out on social media. They are also very vibrant and I would advice using a base in order to avoid them staining your nails. I have used one of these in a previous Manicure Mondays post. Inglot lipsticks are all super-pigmented. I was informed that the naming conventions for Inglot lipsticks indicate their finish. So for lipsticks numbered from 400 – 500, these would be matte. 100 – 200, crème finish. 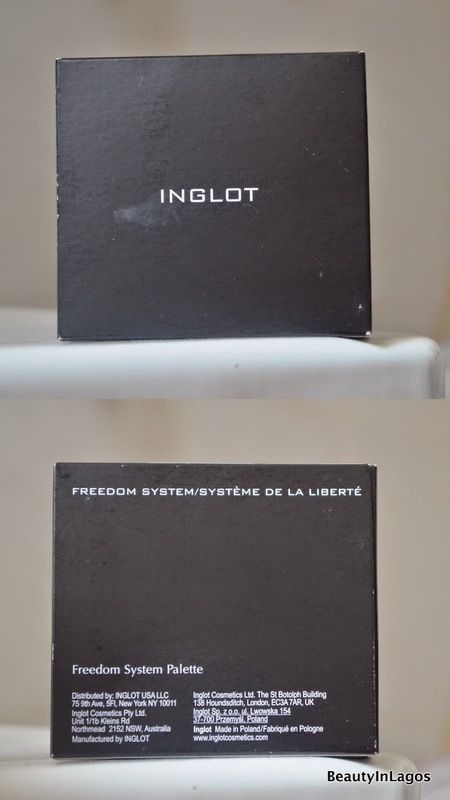 Inglot are famously known for their ‘Freedom System’ palettes. Like most brands, they create and sell palettes which can be customised like normal by adding in products, but what is unique is these palettes can hold eyeshadows as well as lipglosses. The picture above is my Freedom System palette with the lipglosses in. The texture of these vary from one to the other, so be sure to swatch before you buy. They are more like lipsticks that glosses, what I mean is they are a lot more pigmented than your regular lipgloss. Like I mentioned, this isn’t a review. I am just sharing with you guys a few products that are available to buy in Nigeria. Of course there a lot more products available in store like eyeliners, lipliners, eyeshadows etc. I also wanted to let you guys know what sort of price range there are working with. Inglot is cheaper than MAC and the quality is very comparable. I would like to say a HUGE thank you to Bimbo and Happiness at the Inglot Store. They were really helpful over the telephone with giving me the prices of these items. Superb customer service, thank you! What products have you got from Inglot? Wow! So excited..please do swatch the lip products sometime. Thanks! How can I locate your office in Lagos ? Hi BIL. Am lliving in lagos and I want to start a business base on make up and I need advices. The Enugu mall is called the "Polo Park" Mall. Hi, how can I be a Beauty representative for inglot??? Hi will like to be an inglot beauty rep. How do I go about it? please am living in abia, but how can I order iglot makeup, I need the blushe, stick foundation, and mascara. Where is inglot shop in Lagos am at Ikeja Lagos state, how can be a meberm thank you. Pls, is there an Inglot store in Abuja. I bought compact powder from polo Park Mall Enugu… Ingot outlet and it was total rubbish… Yes, I bought it on Friday, went home, then took it back to them with a fight self… They can’t help it, they are Sales girls and not INGLOT…. You people wants to close up abi?? Chart…. The powder is dust, not d ingot I bought twice last year from same Ingot Shoprite building….I can see you people now order powers from CHINA?? ?